There were 21 members and 10 candidate members of the Central Committee at the time of the Revolution in 1917, including Vladimir Ilyich Lenin, Leon Trotsky, Grigory Zinoviev, Lev Kamenev, Josef Stalin, Grigory Sokolnikov, Andrey Bubnov (the seven members of the first Political Bureau), Alexandre Kollontai, Nicholai Bukharin, Yakov Sverdlov, V P Nogin, Alexei Rykov, Artem Sergeyev, Y. Miliutin, Felix Dzerzhinsky, Leonid Petrovich Serebryakov, the Latvians Ivars Smilga and Berzin, Nikolai Krestinsky, M K Muranov, Stepan Shaumian and Moisei Uritsky and Vladimir Antonov-Ovseyenko who both sided with the Mensheviks in 1903 but, like Trotsky, joined the Bolsheviks before the Revolution. 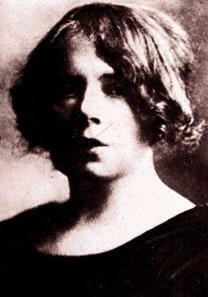 Elena Stasova was a candidate member and Secretary to the Central Committee. 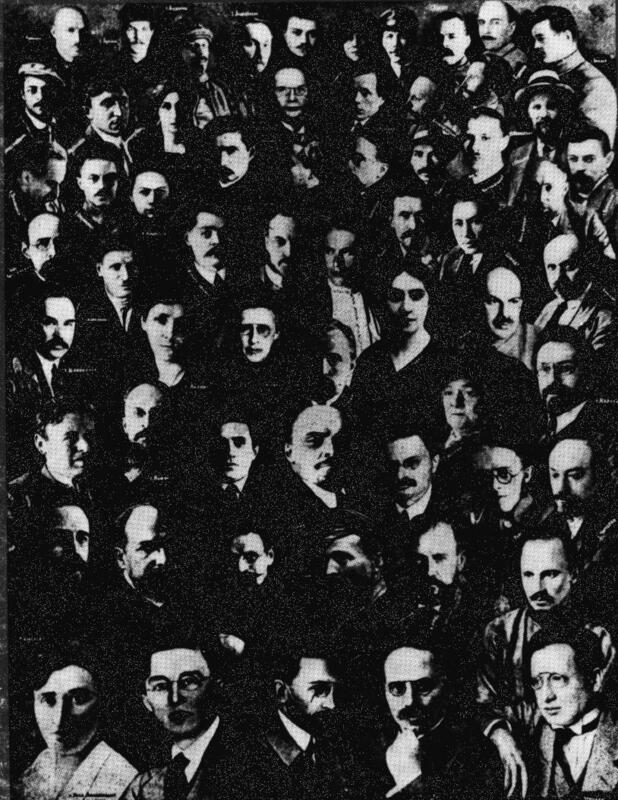 George Lomov (Oppokov), Adolf Joffe, Alexey S Kiselev, Prokopius Dzhaparidze, and Yevgeny Preobrazhensky, Yakovleva were candidate members of the C.C..
Other leading members of the Bolshevik Party, many more well-known than some of the Central Committee members, whose writings are archived on the M.I.A. include: Christian Rakovsky, Karl Radek, Nadezhada Krupskaya (Lenin’s wife), Anatoly Lunacharsky, David Riazanov, Natalia Sedova. 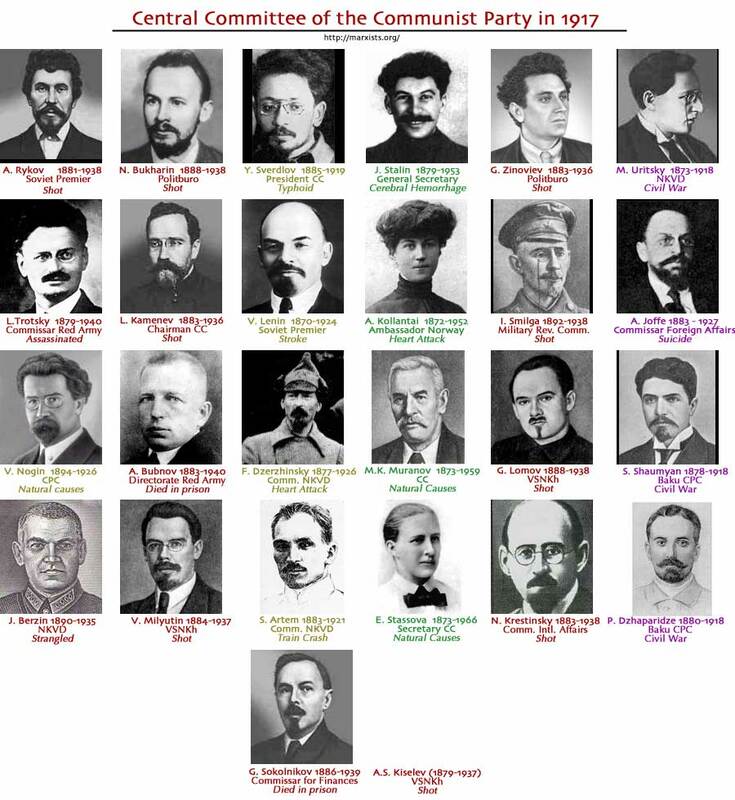 Other well-known Bolsheviks include Mikhail Kalinin, Vyacheslav Molotov, Yuri Pyatikov, the trade unionist Mikhail Tomsky and A.G. Schliapnikov a member with Kollontai of the Workers’ Opposition in 1922, the “Old Bolsheviks” Maxim Litvinov, Mikhail Lashevich, Gregory Ordzhonikidze and the science fiction writer Alexandr Bogdanov, also famous for his 1908 dispute with Lenin over philosophy. Inessa Armand (often remembered for her affair with Lenin), Ivan Smirnov, Sergei Kirov (whose assassination was a trigger for the first of the notorious Moscow Trials), and Nikolai Krylenko. 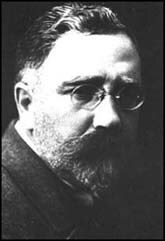 Mikhail Frunze was one of those who joined the Bolsheviks before the Revolution, but who had supported the Mensheviks in 1903, and a leader in the Red Army, while the great Red Army General Mikhail Tukhachesky was one of millions who joined the Bolsheviks after the Revolution. August 1917 – 5 March 1918: Artyom (Sergeyev), Berzin, Bubnov, Bukharin, Dzerzhinsky, Zinovyev, Kamenev, Kollontay, Krestinsky, Lenin, Milyutin, Muranov, Smilga, Sokolnikov, Stalin, Trotsky, Uritsky and Shaumyan; candidate members: Dzhaparidze, Ioffe, Kiselyov, Lomov (Oppokov), Preobrazhensky, Skrypnik, Stasova, Yakovleva. 8 March 1918 – 17 March 1919: Artyom, Bukharin, Vladimirsky, Dzerzhinsky, Zinovyev, Krestinsky, Lashevich, Lenin, Sverdlov, Smilga, Sokolnikov, Stalin, Stasova, Trotsky, Shmidt; candidate members: Berzin, Ioffe, Kiselyov, Lomov (Oppokov), Petrovsky, Stuchka, Uritsky, Shlyapnikov. 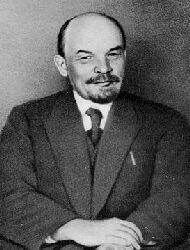 V I Lenin [Archive, biography] was the main theoretician and practical leader of the Bolsheviks, leading a break from the Mensheviks at the second congress of the Russian Social Democratic Labour Party in 1903. 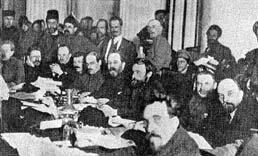 Returning from exile in April 1917, it was Lenin who called for an insurrection in 1917 (See his April Theses) and led the Party to power. A stroke incapacitated Lenin in March 1923, and he finally died on January 21 1924. (See Lenin’s Testament) only shortly after the end of the Wars of Intervention. Leon Trotsky [Archive, biography] did not join the Mensheviks or Bolsheviks until returning to Petrograd in 1917 and becoming convinced that only the Bolsheviks could make the Revolution and agreeing with Lenin’s call for an insurrection. Trotksy led the Military Revolutionary Committee which organised the insurrection and went on to build and lead the Red Army. After Stalin seized the leadership of the Party, he formed the Left Opposition, but was deported and in 1940, assassinated. His History of the Russian Revolution and Revolution Betrayed are important analyses of the Russian Revolution. 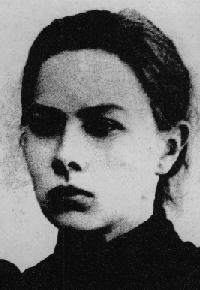 Nadezhada Krupskaya [Archive, biography] was a longstanding Bolshevik and Lenin’s wife. 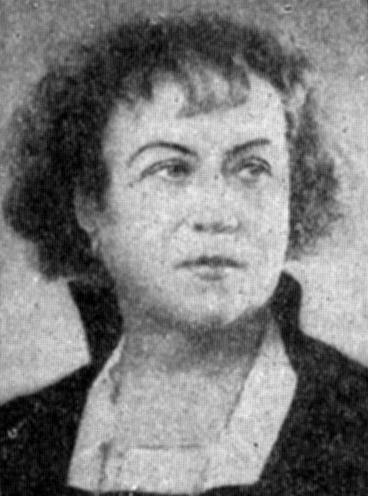 Krupskaya worked in education after the revolution. After Lenin’s death she carried a great deal of prestige but was unable to prevent Stalin’s triumph and was isolated. 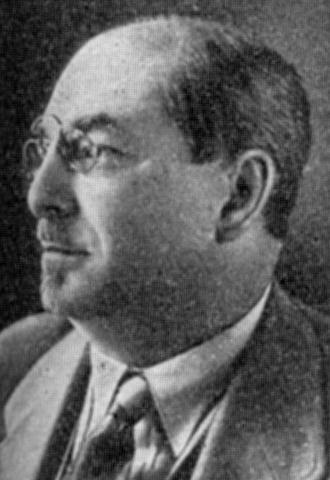 Lev Kamenev [Archive, biography] was an Old Bolshevik, an old friend of Lenin’s from the days before the founding of the R.S.D.L.P.. Kamenev was closely associated with Zinoviev and was eventually shot on Stalin’s orders in 1936. Nickolai Bukharin [Archive, biography] – one of the theoreticians of the Party and a gifted agitator. 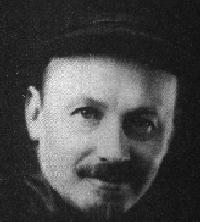 Although initially close to Trotsky, after the Revolution, Bukharin was on the right of the Party favouring more cautious programs of socialisation, and “market socialism”. He was shot in 1938. Natalia Sedova [Archive, biography], Trotsky’s wife who accompanied him into exile. 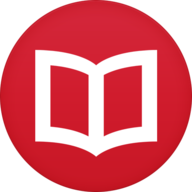 David Riazanov [Archive, including biography] joined the Bolsheviks only in 1917 but is most famous for having led the project in which the new Soviet state collected and published in large numbers, all the writings of Marx and Engels. Without Riazanov’s work there would be no M.I.A. and the basic writings of Marx and Engels may have been lost forever. He died in exile in Siberia in 1938. 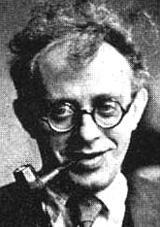 Anatoly Lunacharsky [Archive, biography] – an intellectual and an Old Bolshevik who was one of the leading agitators in Petrograd at the time of the Revolution. 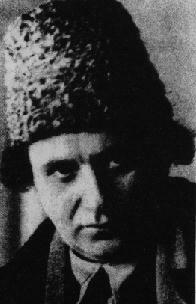 Lunacharsky was the first Commissar for Education after the Revolution. He is most remembered however for his series of biographical profiles on the leaders of the Russian Revolution. Posted as ambassador to Spain but died in 1933. Louise Bryant’s Mirrors of Moscow has pen-portraits of a number of the Bolsheviks in 1923, plus Six Red Months in Russia: An Observers Account of Russia Before and During the Proletarian Dictatorship.